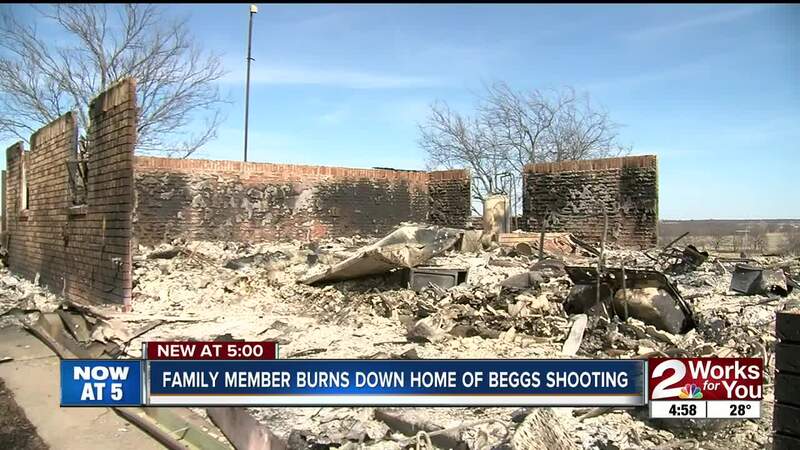 BEGGS, Okla. — A house where a Beggs mother is accused of shooting and killing two of her children has burned to the ground. Investigators said family members burned down the house in Beggs. Investigators believe it was Amy Hall's father who burned down the home. No charges are expected to be filed, because the father owns the property. No injuries were reported in the fire. Hall is the mother accused in the case. Kayson Toliver, 18 and Khloee Toliver, 16, both died in the shooting. Another child was shot, but survived. Okmulgee County Sheriff Eddy Rice said they received a 911 call at approximately 6:30 a.m. November 1, 2018, off South 130 Street for multiple gunshot victims from a guest that was inside the house at the time of the shooting. The brick structure and the memories, both good and bad, are all that’s left. “No one really wants to see it there, every time you drive by it,” shooting witness Eddieson Baldridge said. Baldridge and Austin Stockton say they knew the plans for their friend Kayson’s home to be set on fire. And now that it’s gone, they feel a sense of relief. “Going by the house and stuff, it gives you a bad vibe, but the memories will always be there. the fun times we had,” Stockton said. “For me, every time I went by -- the pictures, image, everything that happened just replayed in my head,” Baldridge said. Baldridge was inside the home when the Tolivers were reportedly shot by their mother. Kayson died at the home; his sister a few days later in the hospital. Both Baldridge and Stockton say they always will remember the good times spent with Kayson. “We always got to do everything we wanted together, fishing, played football, jump on the trampoline, watch the stars at night. Everything like that,” Baldridge said. And with the house no longer a reminder, they can continue moving forward. “It’s like, it can’t happen again because it’s forever gone now,” Baldridge said. Hall's preliminary hearing in the murder case is set for March 8 at 9 a.m.